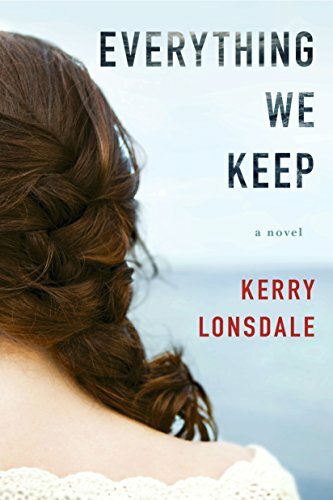 Everything We Keep is a suspense novel by Kerry Lonsdale in which twenty-something Aimee Tierney believes her fiancée, James, who is believed dead, may still be alive. When the novel begins, Aimee attends her would-be husband’s funeral on the very same day they were meant to be married. Aimee is devastated, but her parents and her good friends, Kristen and Nadia, rally around her. James’s disreputable and shady cousin, Phil, in addition to James’s older brother, Thomas, also state their support for Aimee. At the funeral, a strange woman introducing herself as a psychic named Lacy speaks with Aimee, telling her James is still alive. Aimee is stunned and wants to believe this, but cannot. At home, she discovers that eight boxes of James’s paintings are missing. Two days after the funeral, Aimee returns to work as sous chef at the family restaurant. Her parents reveal they are selling the place, and believe Aimee has a second chance at life without James. They explain that Aimee can now be independent and can be her own person without him. This causes Aimee to reflect on knowing James since childhood, falling in love with him through high school, and planning to marry him after college. Aimee falls into a depression for several months, ultimately deciding to lease an old coffee shop in order to open her own. Her family and friends do all they can to support her. Meanwhile, Aimee meets a photographer named Ian Collins, but she resists his romantic advances because she believes James is still alive. When her coffee shop opens, Lacy leaves behind a postcard to Puerto Escondido, Mexico, bearing an image of one of James’s missing paintings and promoting a gallery there. Aimee hires a private investigator to look into things, but he finds nothing. Two years pass. Aimee suddenly receives a package containing one of James’s missing paintings, and a note from Lacy saying that James is safe now, and Aimee must come and see him. Aimee travels to Mexico with Ian for the truth. While there, Ian continues his romantic advances on Aimee, who finds herself falling in love with Ian and trying to push him away because she wants to find James. Aimee is stunned to find James at the gallery listed on the postcard, only to discover James has dissociative identity disorder, meaning he does not remember who he was. Now, he believes he is a man named Carlos. Aimee comes to learn through Imelda, the woman looking after James, and later, through Thomas, that James originally went down to Mexico before the wedding to confront Phil over criminal business activity with drug cartels, and which threatened the family company. James did not know Thomas was already cooperating with the DEA to get rid of Phil, and this led to James nearly being killed by Phil and the cartels, the result of which was James’s identity disorder. Thomas arranged for Imelda to look out for James, arranged for James to be Carlos and have a gallery, paid off the private investigator hired by Aimee, and ensured that James could not be found by Phil or the cartels. Imelda reveals she hired Lacy to get in touch with someone who knew James from before, while Thomas reveals he paid off the building owner of Aimee’s coffee shop so Aimee could restart her life. When talking to James as Carlos, Aimee discovers Carlos has had the life he has always wanted as James. She learns Carlos was even briefly married, until his wife died of a brain aneurysm. She learns that Carlos even has a son. She realizes she cannot force Carlos away from the life he has known, and decides to simply let things be. She is heartbroken by losing James, but finally commits to Ian. Ian reveals his reasons for accompanying Aimee to Mexico were not just to help her out of love, but to find Lacy, for Lacy was the psychic who found him when he went missing as a child, and he now hopes Lacy can help find his own mother, who has been missing for years due to identity disorder. In the epilogue of the novel, five years later, Carlos’s identity disorder suddenly goes into remission, and he finds a note from himself, telling himself he is James but has been living as a man named Carlos. Kerry Lonsdale believes life is more exciting with twists and turns, which may be why she enjoys dropping her characters into unexpected scenarios and foreign settings. She graduated from California Polytechnic State University, San Luis Obispo, and is a founder of the Women’s Fiction Writers Association, an online community of authors located across the globe. She resides in Northern California with her husband, two children, and an aging golden retriever who’s convinced she’s still a puppy. Everything We Keep is Kerry’s first novel. Connect with her at www.kerrylonsdale.com. Good story. Thought I had it figured out but then the twist was put in could not wait until the next part. The opening sentence hooked me immediately. Lots of unexpected twists and turns. Great storytelling about love lost and found. I think I’ll grab the next book in the series…. Had a hard time putting it down, so I finished it in 2 days! I’m going to search for more books by this author.